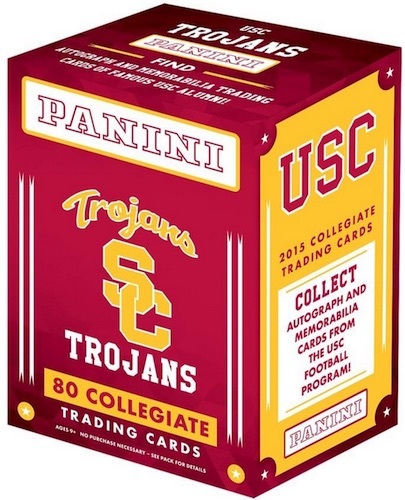 2015 Panini USC Trojans Collegiate is one of several school-specific products that feature a multi-sport format. Centering on the University of Southern California, the release includes one autograph or memorabilia card per box. With 80 cards, the base set is one of the deepest options among all the schools. The football program is heavily covered and headlined by Carson Palmer, Troy Polamalu, Mark Sanchez and Hall of Fame running back Frank Gifford. 2015 NFL rookies include Nelson Agholor, Leonard Williams and Javorius Allen. Basketball is represented by Taj Gibson and Bill Sharman, and baseball greats include Mark McGwire and Randy Johnson. In addition to the base subjects, former football stars are also featured in the Signature and Memorabilia sets, with parallels limited to 99 copies or less. Honors seeks to identify the those players who have received the highest recognition, including Heisman Trophy winners and All-Americans. Collectors can also find a variety of parallels that extend to the base and insert card options. This includes Silver, Gold and Black. 2014 Upper Deck Marqise Lee Star Rookie AUTOGRAPH USC Trojans Jaguars AUTO Sp! 77 cards. Player position noted below.